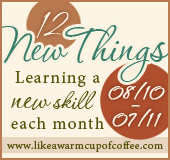 Though Sarah Mae at Like a Warm Cup of Coffee is no longer doing this (she had to scale back), I decided to continue on my own and I thought you might like my November update! I found a great tutorial on making butter pie crust at Smitten Kitchen. I felt fairly confident that I could handle this crust and so went ahead and made it...the night before Thanksgiving. It didn't go so well. No fault of the recipe or tutorial! Just my own unfamiliarity of working with dough! I used the crust anyway. 'Cause wasting a stick of butter just doesn't sit well with me. I should have started over. Really. Here it is. Unsuccessful pie crust that should not be used. Go ahead and laugh. I won't be offended! May I list out a bit of advice on pie crust? - One should make sure that the chunks of butter in the dough are the size of small peas rather than the size of pea pods as in the above pic. - When cutting the recipe in half to make a single crust, one should remember to cut the amount of water in half BEFORE adding it to the mixture. Adding lots of flour after the fact to make up for it does not make good pie crust. - After rolling out, if it looks like clumps of butter barely joined together by dough, one might consider starting over. 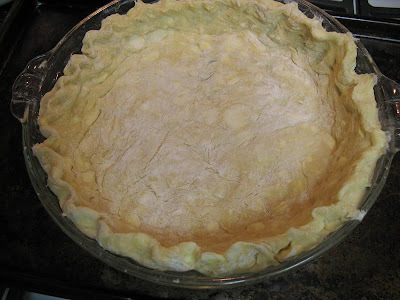 - If one is going to really mash the dough into a glass pie plate trying to shape it into something that resembles crust, it might be nice to butter the pie plate so the crust will actually come out later. - If one gets too tired and decides to make pie in the morning instead, one should probably cover crust that is already in pan in refrigerator with plastic wrap so crust doesn't completely dry out. - If one decides to use the crust anyway because one rationalizes that it will be filled with pumpkin deliciousness (I tried this Cinnamon Streusel-Topped Pumpkin Pie) so maybe nobody will notice, then during dessert time one should declare loudly "I don't know WHAT happened to this crust - I should get my money back!" - One should get pictures of failed pie crust as it's sure to make a good post if one happens to be a blogger. So now I see that pie crust takes practice and patience! Yes, I will try to make this butter pie crust again. I have a feeling that it will take me a few tries to get it right. I guess that's what learning a new skill is all about! It doesn't mean that you will be instantly good at it! I did not yet finish my November project of reorganizing my China cabinets, but hey, the month isn't quite over! My book for November was Pride and Prejudice which I finished today - *happy sigh*! Love that book! In fact, I didn't start it until after Thanksgiving because I knew it might distract me from making things like...pie crust. I hadn't read Pride and Prejudice in years and realized that the A&E version of the movie (which I own thanks to hubs!!) is very close to the book which makes me happy! I let my Mom make pie crust LOL. Check out the book Ratio. Fab book and describes the whys to making things. I've learned you can't overwork your dough... that will get you. My trouble is rolling it out - I can make the pie crust fine,and it tastes good, but somehow, it always falls apart when I roll it and try to get it in the pan. On a side note - I LOVE Pride and Prejudice. It's one of my guilty pleasures - on my lazy days, that's the movie I pop in. I'm with the above comment: my problem is rolling it out. It always takes twice the flour in the recipe to keep it from sticking to EVERYTHING. If I'm in a patient mood, I try it. If I'm not, I ask my husband to roll it out (he's much more logical, much less emotional). I always use Tender Flake lard for pie crust just as my mother did before me and use the recipe on the box. This always makes the best crust...I know...lard is saturated fat and not good for the arteries, but so is butter...but to me, nothing else makes a better crust...and the pie is only a treat for special occasions! Oh my friend, I like the big chunks of butter in there. LOL! And I think it came out okay. The question is how did it taste? Big I'll take chunky butter over pea sized butter any day of the week! LOL!